Sandy is an online friend that I've been networking with for over a year now, which is crazy. I find endless support, encouragement, loyalty, and friendship in Sandy. She's a gem. 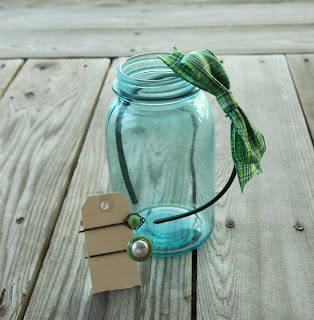 Her blog has been a favorite of mine for just as long & when she opened her shop I was just smitten. Bonus: We're actually roommates for a conference coming up in April. Fun! Sandy's shop features accessories that are floral, feminine and just plain fun. I have a few of her felt bow clips and *love* them. I wear them in my hair, on a cardigan, and have even worn it on a thin belt. Here are some of my favorites from Sandy A La Mode. Visit Sandy's shop & leave a comment telling us what catches your eye. "Enter to win some GREEN @sandyalamode accessories on @OhSweetJoy's blog! http://tinyurl.com/2ddk985"
I love her teal tart silver filigree ring!!!! It's so beautiful, and of course I love all of her dainty little bows! I love her Strawberry Cobbler Filigree Ring. And I also love all her dainty little bows!! i am following you and sandy on twitter! 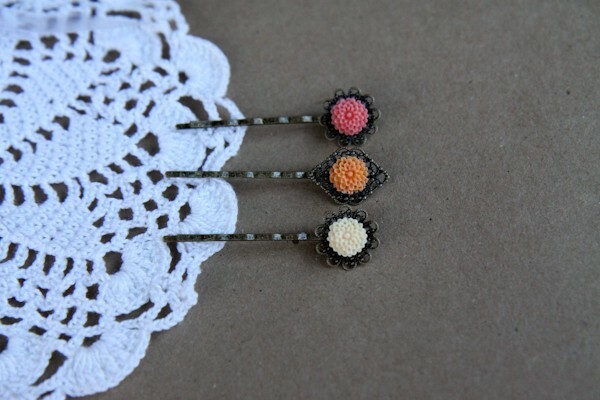 i love the vintage hair pins! Oh love this set! I've been eying it! I follow both of you on twitter too! And I just tweeted it! Thanks for the wonderful giveaway! Have a great day dear! I love the Diana red felt bow clip! I LOVE the lacey and jessica - bow clip and hairpin set! So cute. I love the strawberry cobbler and key lime pie rings! SO CUTE! I'm an avid headband wearer so naturally my fave is the headband! However, the joanna and jessica hairpins are really beautiful too! I follow Sandy on Twitter. Of course I am a follower of yellow songbird! Follow Yellow Songbird via GFC as Monik. I love the Lacy and Jessic bow clip and hair pin!!! Her shop is just so precious! Thanks for the awesome giveaway! Follow Sandy and you on Twitter as @monikaretnani. I love her shop! I especially love her broochs. I don't know what it is about them, but I think they are adorable! I love the little flower hairpins! And I follow you both on Twitter (@melissastamps). I tweeted! :) Thanks so much! I love the key lime ring or the teal ring. I have one of her bows and I love it! I have new short hair and I would love those sweet little flower bobbypins! I love Sandy and this giveaway! 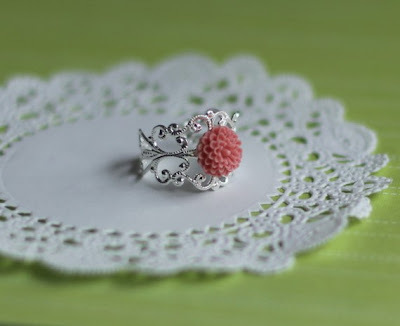 I love the key lime pie silver ring! too cute! I love "Ella & Emma" from Sandy's shop! 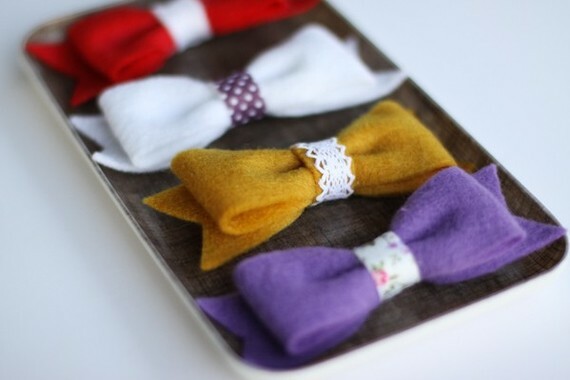 Her felt bow-every single last one-should be in my accessories collection right now. Especially that adorable red and white one! ive actually been eyeing that very headband. its def a fave - along with all of her hair clip bows! I love her electra - electric blue felt bow clip! What a fun shop!!! LOVE the key lime pie silver ring. So fun! Love the lacey and jessica hairclip & pin set! I love everything in Sandy's shop, how can you make me pick?!? I love bows and lace and girlyness, so it impossible to choose. I follow both your twitter! Her shop is so cute! I love the lacey and jessica bow and hairclip set, it's perfect fo spring! What a great giveaway! I follow you and Sandy on twitter! I follow both you wonderful "fine" ladies on twitter! I love the vintage pearl hair pins! I love sandyalamode and all her creations. My favorite item from the shop is diana - red felt bow clip. I am a follower of both on twitter as violet_porto. I follow you both on twitter, too! OOh, hard to pick!! The Evangeline, Lacey and Jessica are probably my faves for bows, but I do love those vintage pearl hair clips! You bet I'm a follower! I follow both of you lovely ladies on twittaaa! I love the hair pins...so very cute. I really like the Abigail and Olivia bows. I adore Sandy's bows! I own a large mustard yellow one but have my eye on some of her smaller ones. I love the Joanna & Jessica bows! And I follow you both on Twitter. I'm @heysuburban.